As policymakers grapple with how to ensure economic security for the 5.6 million Californians living in poverty, one option needs to be part of the discussion: a state Earned Income Tax Credit (EITC). A state EITC could give millions of Californians a much-needed economic boost by building on the successful federal EITC, a tax credit that has been instrumental in lifting families out of poverty and helping them make ends meet. To be effective, a state EITC must be refundable. While Californians pay a variety of state and local taxes — and low-income households on average pay a larger share of their income on taxes than do higher-income households — many low-income households do not pay income tax because of its graduated structure. If a tax credit is refundable, then a taxpayer receives the credit even if they do not owe any income tax. This is key if policymakers want a state EITC to reach those who would most benefit from it. A refundable state EITC would reach about one in five California families, while a nonrefundable state EITC would reach less than 0.5 percent of California families. A state EITC is typically set as a percentage of the federal credit. Generally, a state EITC is directly based off the federal EITC and will simply “add on” to what the federal credit provides. (For additional detail on how the federal EITC works, see this useful summary.) This means that the main features of a state EITC — who is eligible for a credit and how the size of the credit varies for different types of households — are already established. If California were to pursue this path, one of the most important decisions is at what percentage of the federal EITC to set the California credit. The higher this percentage, the larger the credit to families. For example, a refundable, 15 percent state credit would provide, on average, a $321 tax credit to families in the bottom fifth of the income distribution, while a 30 percent credit would provide an average tax credit worth $638 to these families. 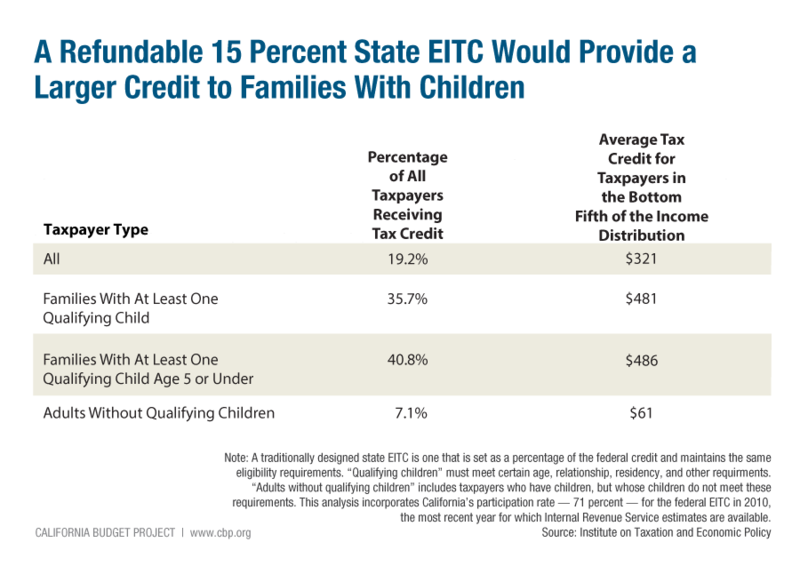 A state EITC structured as a simple add-on to the federal credit would primarily benefit families with children. Under this model, a larger share of families with children than without children would receive a credit, and the credit would be, on average, substantially larger for families with children. For example, if California had a refundable state EITC that was 15 percent of the federal credit, a little more than one-third of families with at least one child (36 percent) would receive a credit, compared to just 7 percent of households without children (see table). Moreover, the average credit for families with at least one child would be $481, compared to just $61 for childless adults. As our report outlines, there are plenty of reasons to pass a state EITC. Not only would it give more than 3 million households additional economic support, it would also help rebalance California’s tax system, which currently asks the lowest-income households to pay the largest share of their income in taxes. 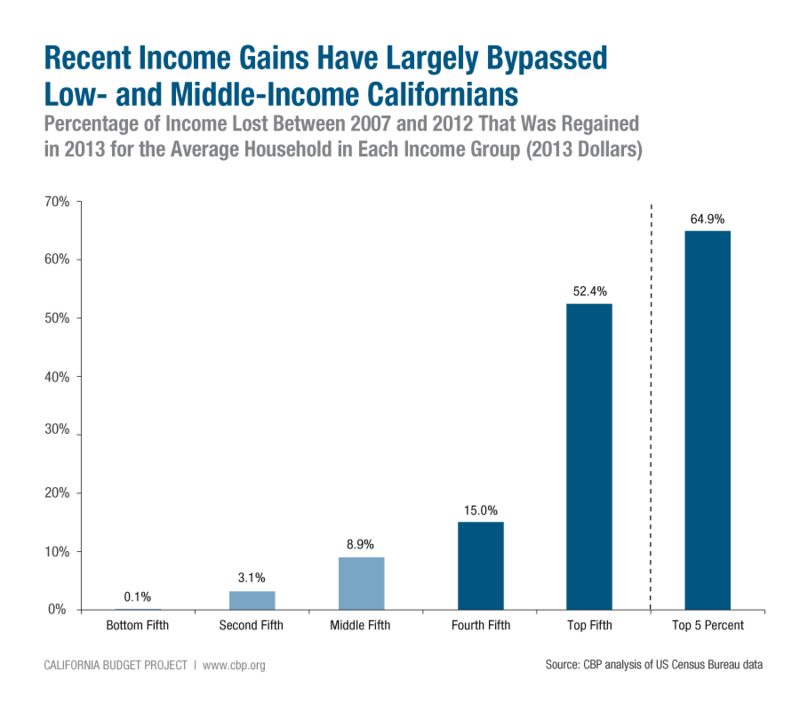 Further, a state EITC would help strengthen California’s safety net. 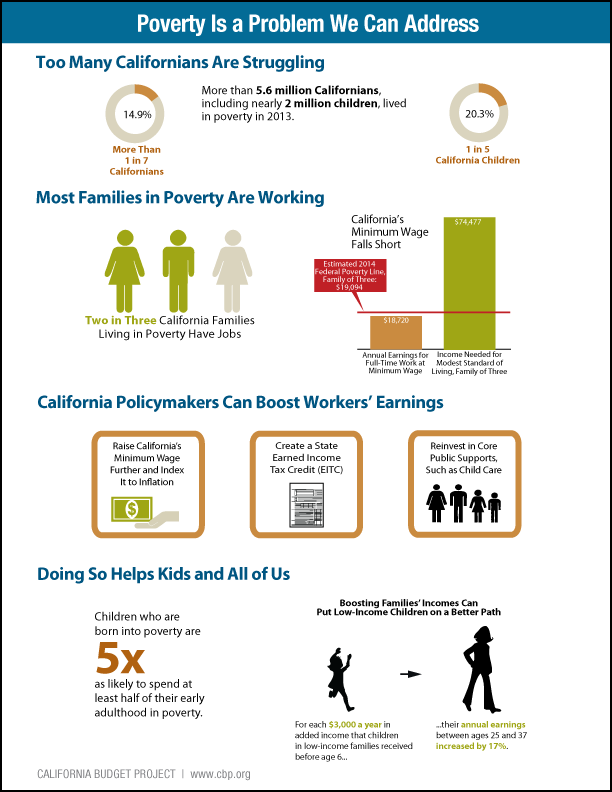 It’s a smart approach to the crisis of poverty in California. In the coming weeks, additional posts on this blog will look in depth at different aspects of a state EITC.